Chairman of the Presidency of Bosnia and Herzegovina Mladen Ivanić stressed that issues of sustainable development must animate all the spheres of society - the public and private sectors, as well as the non-governmental organizations and civil society. 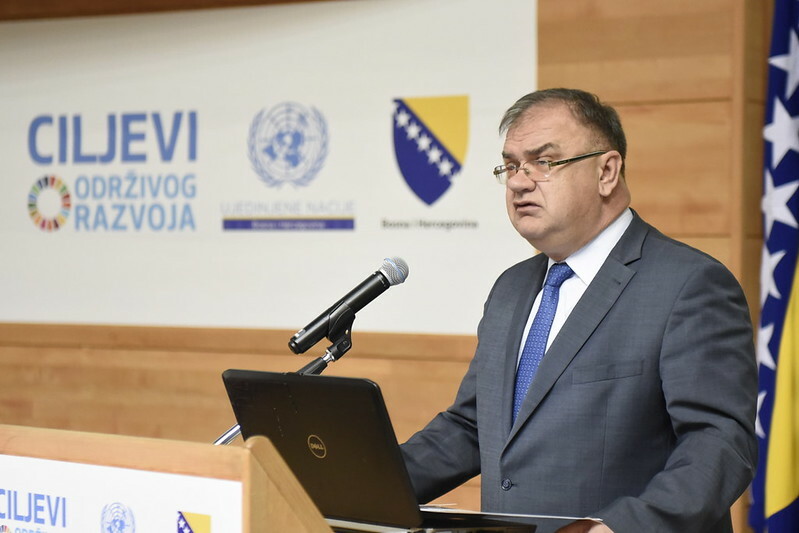 4th Dialogue Platform Conference dedicated to the implementation of Sustainable Development Goals in Bosnia and Herzegovina was organized by the BiH Presidency and the United Nations (UN) in Bosnia and Herzegovina. The implementation of the Sustainable Development Goals and the importance of the commitment by a country to fully assume the responsibility for the goals were the focus of the conference attended by the Special Representative of the European Union in BiH, ambassadors of Germany, Switzerland, Sweden, the Special Envoy for the Sustainable Development Goals, the Minister of Defense, as well as the representatives from all levels of government, local entrepreneurs and representatives of civil society organizations. "The Presidency of Bosnia and Herzegovina obliged the Council of Ministers at the beginning of the year, together with the entity governments, to create a proposal of the strategy for sustainable development within BiH, but these things still do not attract sufficient attention and obviously a lot more effort is devoted to other things, rather than actually substantive issues. It (the strategy) should be an example and a guiding principle for a community or a country to follow and a way to come closer to generally acceptable standards in the rest of the world. "said Ivanić. He stressed that this document should be a concept for the country and the direction it is taking, and how to achieve the generally accepted standards in the world, and that this is a global agenda that every country should follow in order to develop. He expressed his satisfaction with the fact that the United Nations in Bosnia and Herzegovina organized the conference, and thus put pressure on the authorities in BiH to carry out this process. UN Resident Coordinator in BiH, Sezin Sinanoglu, reminded that in 2015 the member states of the UN adopted the 2030 Agenda, which was formulated through 17 goals of sustainable development as a new global framework in which economic, social and environmental elements are integrated in a comprehensive development strategy. Bosnia and Herzegovina has accepted all of these goals in 2015, thus becoming a party to this agenda. "2030 Agenda and its 17 targets represent the "Agenda of Hope ", which should contribute to eradicating poverty, reducing hunger in the world, better environmental protection, addressing climate change, and should lead to significant partnerships for achieving these goals throughout the world", Sinanoglu said. UN Resident Coordinator explained that these 17 goals should contribute to the achievement of sustainable development in BiH, as the people in Bosnia and Herzegovina must be informed and familiar about the Sustainable Development Goals, while initiating action throughout the sectors of society, governmental and non-governmental organizations, civil and private sector, so that all work together in partnership. She pointed out that these goals are not important only for underdeveloped but also for the developed countries. Swiss Special Envoy for Sustainable Development Goals, ambassador Michael Gerber said that the 2030 Agenda is the most comprehensive and most diverse agenda of this kind the world has ever had. Gerber said that it is an agenda that deals with the economic sector, but also environmental and social challenges, and most importantly, it integrates issues of peace, stability and good government and good governance. Addresses and presentations focusing on importance of SDGs for Bosnia and Herzegovina and all countries of the world were delivered by H.E. Ambassador Lars Gunnar Wigemark, Head of EU Delegation to BiH and EU Special Representative in BiH, H.E. Christiane Constanze Hohmann, Ambassador of the Federal Republic of Germany in BiH, H.E. Ambassador Michael Gerber, Swiss Special Envoy for Global Sustainable Development, Mr. Siniša Šešum, Head of UNESCO Antenna Office in Sarajevo, Mr. Victor Olsavsky, Head of WHO Country Office in BiH, Ms. Jelena Knezević, Head of Department for Sustainable Development and Integrated Coastal Zone Management, Ministry of Sustainable Development and Tourism in Montenegro, Envesa Hodžić-Kovač, Development, Research and M&E Specialist, UN RCO in BiH, Mr. Igor Radojičić, Mayor of Banja Luka, Amer Kapetanović, Assistant Minister for Bilateral Relations and Economic Diplomacy, Ministry of Foreign Affairs of BiH, Prof. Dr. Elvir Čizmić, Vice Dean for Research, Doctoral Studies and Projects, University of Sarajevo, School of Economics and Business Sarajevo, Mr. Velimir Jukić, Director, Agency for Statistics of BiH, Mr. Edin Mehić, Co-Founder of Networks, Mr. Zoran Zeljko, Director, BiH Directorate for Economic Planning, Jovana Bjelaković, Deputy Director, Smart Office Banja Luka, Mr. Armin Talić, General Manager, BIT Alliance and CEO, Center for entrepreneurship and knowledge management of the Faculty of Economics of the University of Sarajevo, and Emina Bečić, Programme Manager, Association Infohouse.